We use Automatic Pool Covers, Inc, they have been in business for more than 35 years offering a safer environment around the pool area. These covers are not just for the new builds we do, it is possible to add an auto cover to your existing pool. If you are curious about the process, come into the store and we will help you. Most of our equipment is supplied by Hayward, a leading manufacturer in vital parts of any swimming pool. Below you can find some short decribtions and ways to learn more about our equipment, of coure you can always come in if you have questions. The World's #1 Salt Chlorinator. 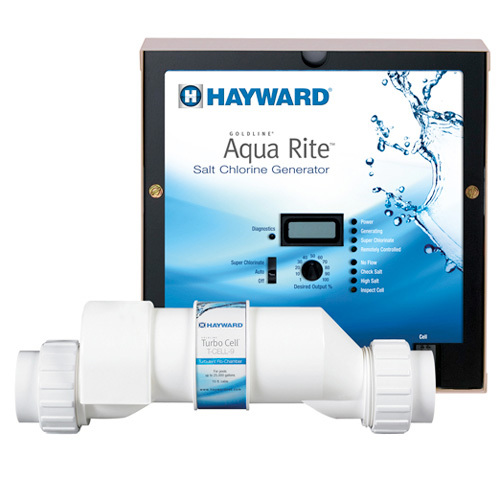 Hayward's AquaRite® Salt system is the convenient alternative to conventional chlorine - bringing your pool the very best in soft, silky water with no more red eyes, itchy skin, or harsh odors. It’s remarkably convenient, too, automatically delivering chlorine for the ultimate swimming experience. AquaRite® is independently certified by the National Sanitation Foundation. And with the industry’s best warranty support plus 50% or more savings over conventional chlorine, no wonder it’s the World’s #1 salt chlorinator today! The ProSeries top-mount sand filter utilizes a precision engineered umbrella-fold self-cleaning lateral system to provide efficient flow and evenly distributed water for totally balanced backwashing and long lasting performance. The Universal H-Series is an energy efficient, high performance, installation adaptable commitment to the pool service professional. Outside of pool accessories we do offer a wide assortment of deck furniture, spas that will suite your needs, and deck fountains that will make your pool look spectacular. We carry Garden Leisure Spas. Step outside your fast-paced life and into the soothing, effervescent, crystal clear waters of Garden Leisure Spas. Built to last and designed for comfort, Garden Leisure spas offer everything discerning spa owners crave. Ample room and first-class amenities make for a winning combination while high performance equipment and a wide variety of jets ensure users true hydrotherapy. Garden Leisure Spas will bring a sense of vacation to your backyard when paired with your beautiful pool. Deck jets are an easy way to add some spice to your pool setup. They are installed before pouring the concrete on the pool deck, and can arranged to please the customer. They are easily controlled and maintained.